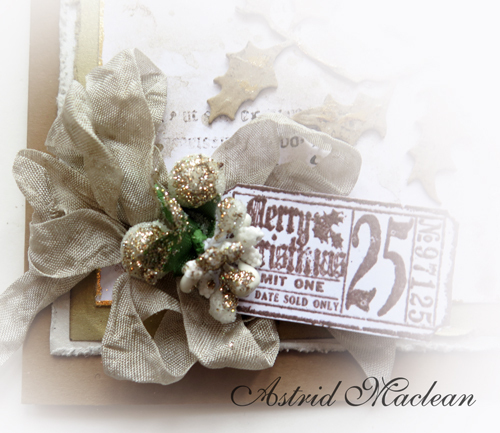 November Destination Inspiration at A Vintage Journey. 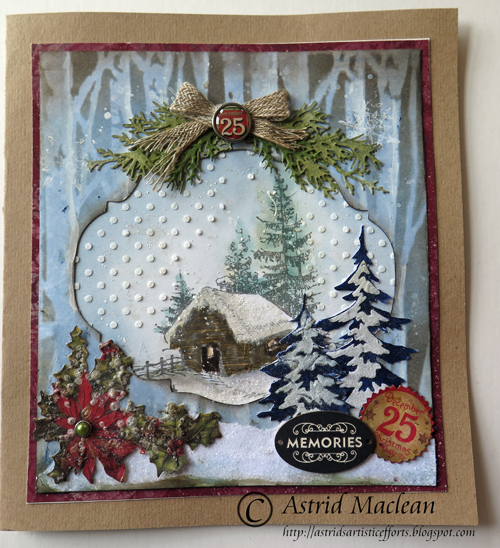 Hello all, hope you are keeping warm and cosy! Hello all, welcome and I hope all my American friends had a great Thanksgiving!! 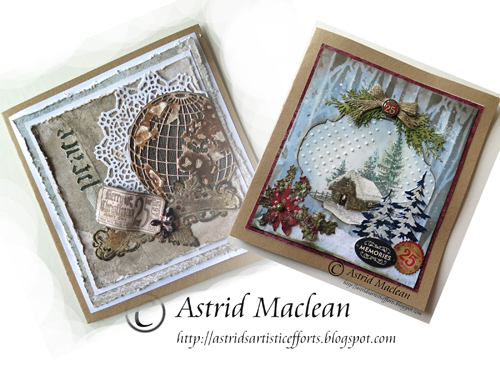 Today I have a couple of quick Christmas cards to share. 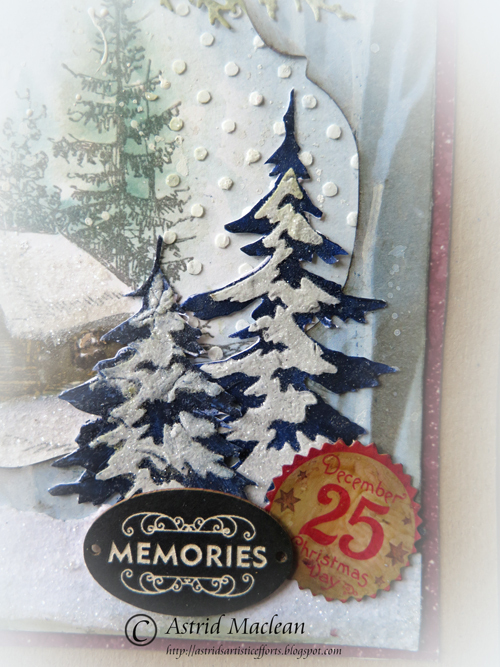 I am still on a mission to make most of this year's cards myself. 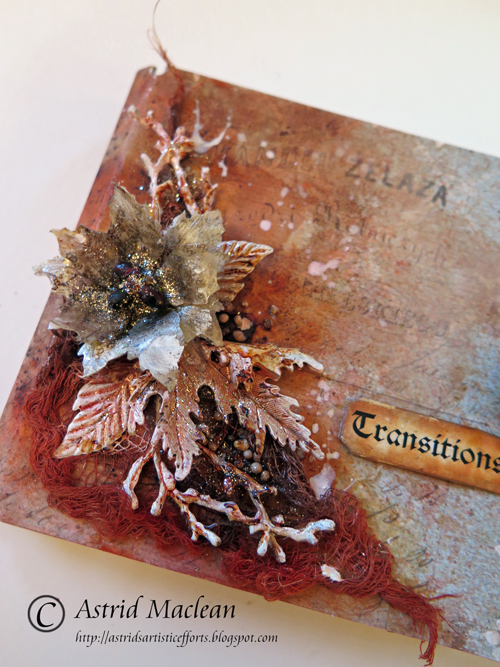 I decided to pull out some of my Tim Holtz stash, - old and new and have a play. I won't bore you with detailed descriptions, but if you have any questions, feel free to email. 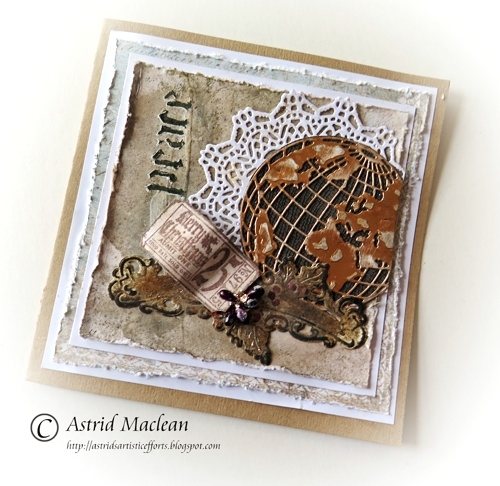 Card number one, using the globe and doily dies. 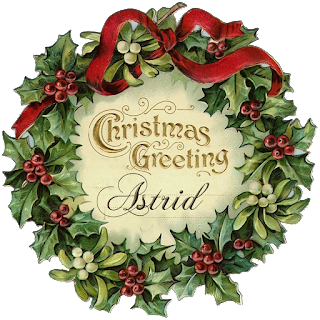 Hi all, hope this month has gone well for you so far. 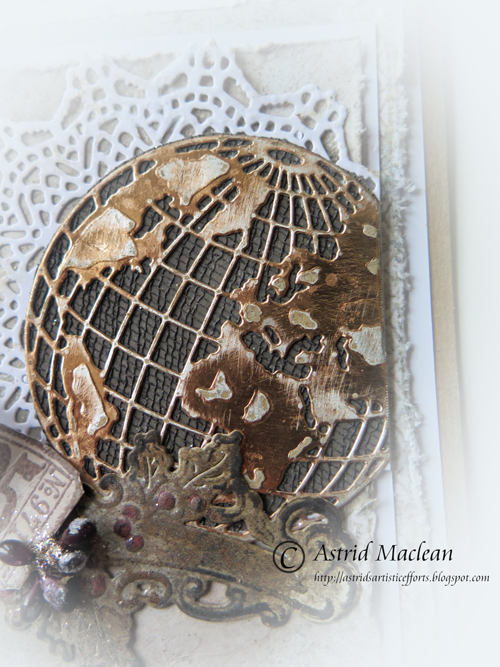 If you want to see more, - well you'll know what to do, - just click HERE Hope the link is working, blogger has been driving me crazy.... Anyway, have a happy week ahead, and thanks for your visit! 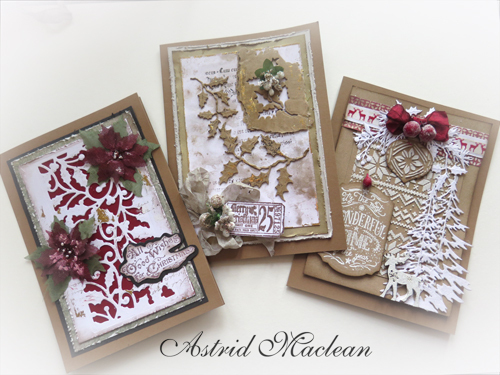 Well, here we are, only about 6 weeks to Christmas and I finally get round to posting my next 3 cards inspired by Linda's tags. If you are new to what this is all about, you can read all about this wonderful challenge by clicking HERE. This is inspired by Linda's tag 4. You can see the original HERE. 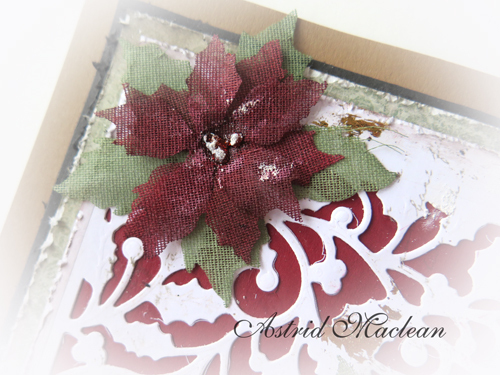 I was inspired by the crinoline poinsettias, and by the white layer on top of the red. I just changed my colouring to a darker red, and as I did not have many of the products Linda used, I improvised with what I had. 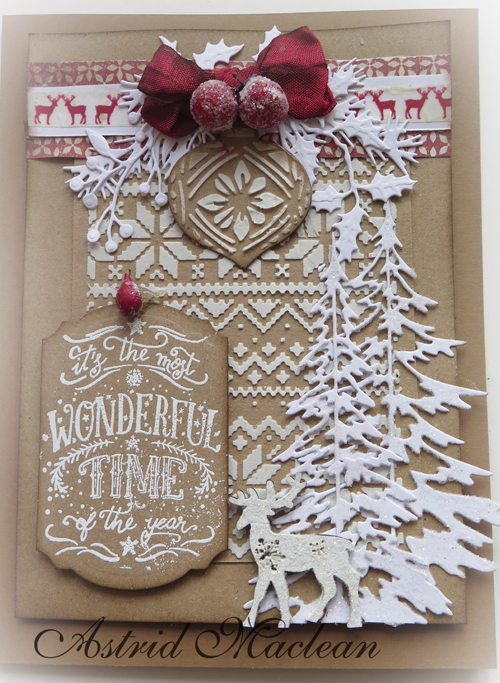 My top layer was created with a holly die, I think it's from Crafters Companion. 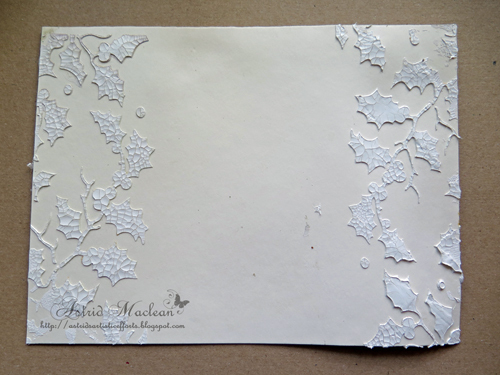 Here's a close up of the poinsettia, I brushed on some gesso for a snowy effect, but now wished I hadn't as the spray I used to colour my crinoline (a mix of Festive Berries and Aged Mahogany Distress Spray) started to run and turned it slightly pink (yuk). 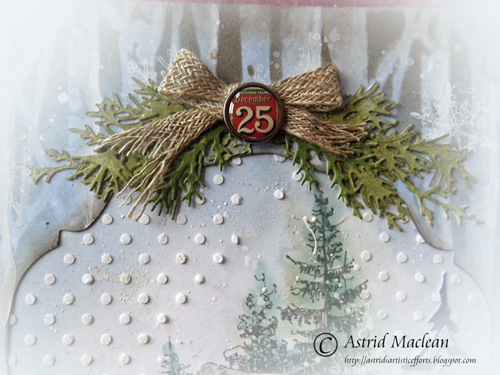 I used the same stamp Linda did for her tag, but fussy cut it and mounted it on some black card as it did not show up enough. 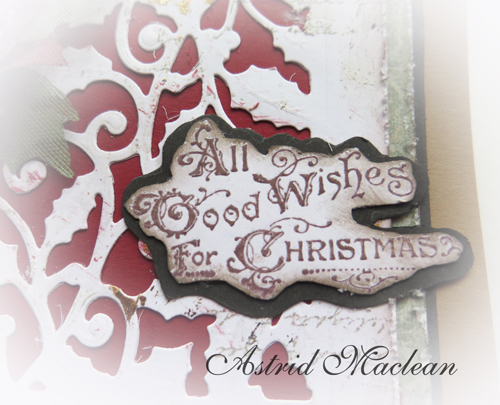 Alright, onto tag number 5, I am turning all of mine into cards this year. 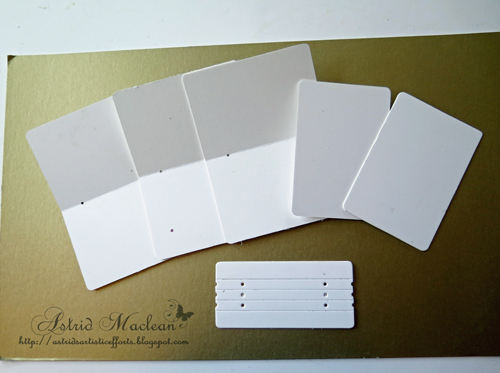 I was inspired by the colours Linda used, Kraft and cream, - though mine is more white. 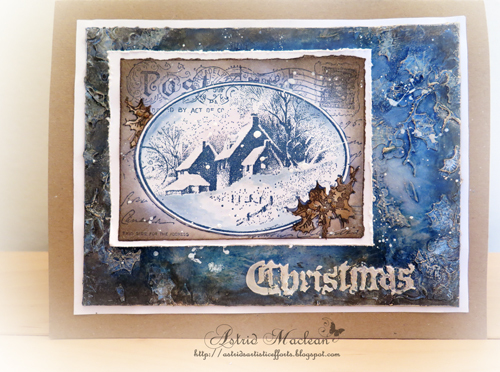 As my cards are smaller than Linda's large tags, I changed the lay out quite a bit, but I loved how she made use of both the positive and negative of the holly die cuts and her use of background stamping with text. 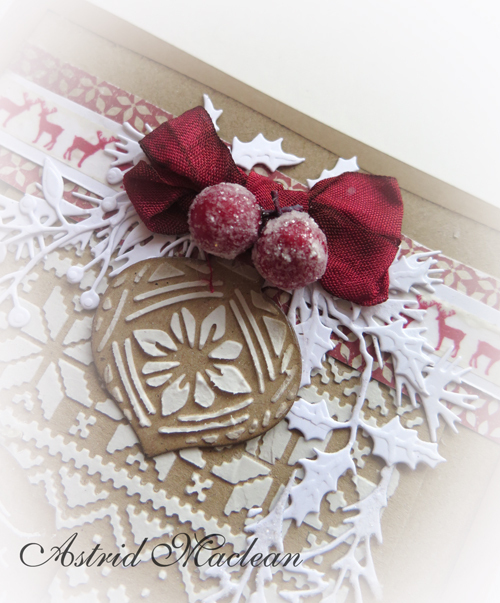 Above a little close up of how I finished mine with ribbon and berries. 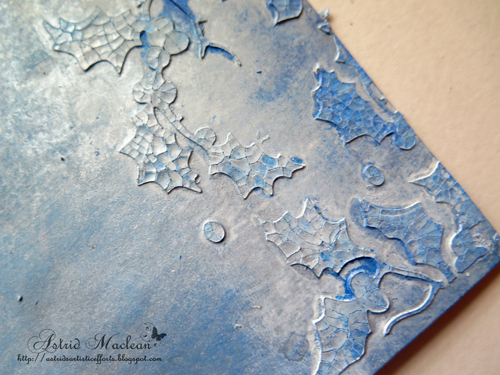 I obviously used Tim's Nordic Layering Stencil aswell with white texture paste, and then substituted with what I had in my stash, to create something in a similar style. 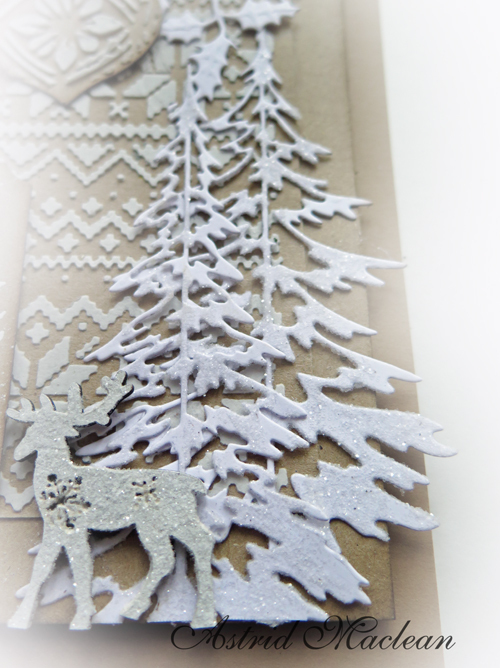 I loved Linda's heart, and tried to achieve something similar with a bauble die that has a pattern for embossing, instead of doing that I cut it and then used it as a stencil with the paste again. It's a little Marianne die. 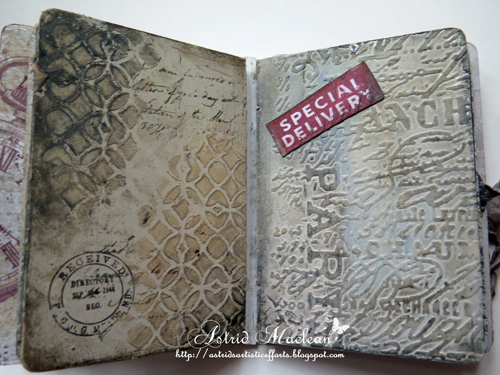 I used exactly the same stamp for the greeting, white embossed like Linda had done. I don't have the tree die Linda used, nor the deer, so I just adapted with what I had. 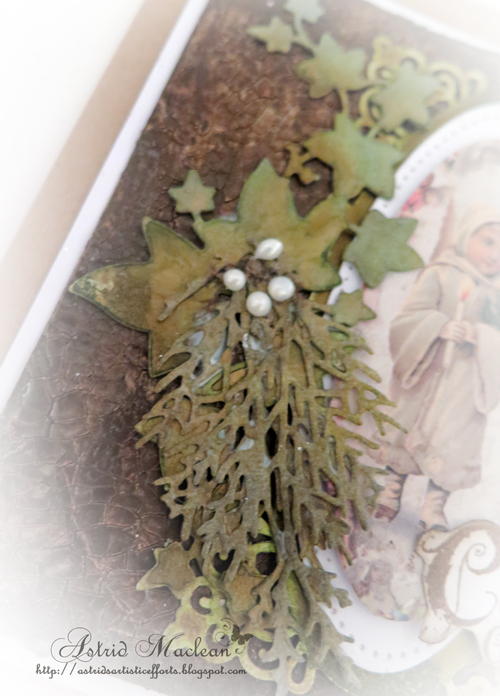 The little deer is a chipboard embelly I found in my Christmas box, that I just painted white with gesso. Well, there you have it, 3 more for the box... I just love this challenge as Linda makes me think of things that I would never have thought of myself. Thanks so much Linda for all your inspiration!! Hello friends, thanks for dropping in. There are loads of pages here, so I thought once the addresses of people she is going to visit have been added, on the remaining pages, participants could maybe add some quotes or other messages and the little book could eventually, after Paloma has finished her journey, be sent to Lys as a gift for starting this wonderful project. Anyway, I'll give you a quick run down of how I put the book together and show you some more pages. 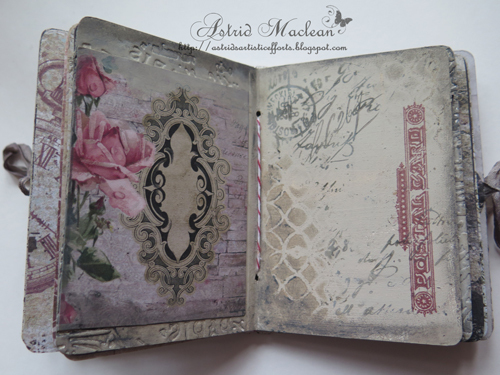 I used Eileen Hull's Passport book die, and started by cutting all the different parts from mat board, plus two additional pages also from matboard. Next I cut a number of inner pages from scrapbook paper (Blue Fern Timeless). 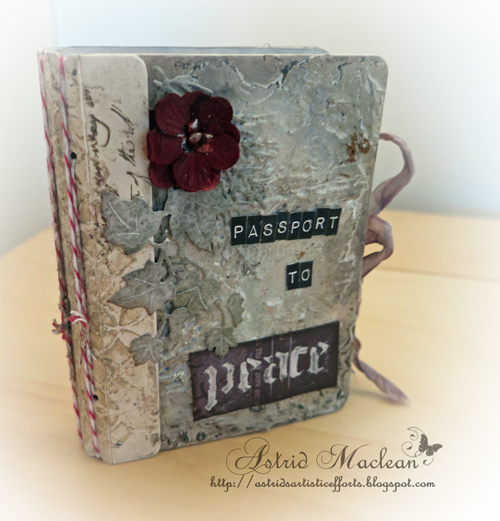 For putting the book together I followed Eileen's instructions she gives in this video. 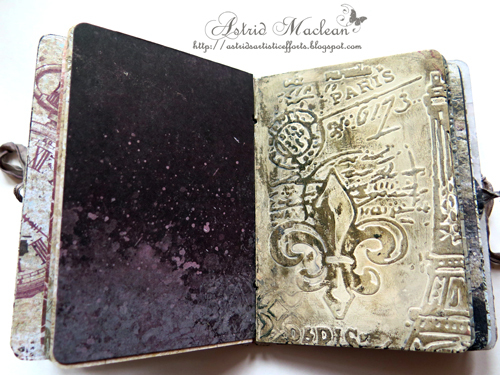 But before doing that, of course I had fun decorating the pages, cover and spine. 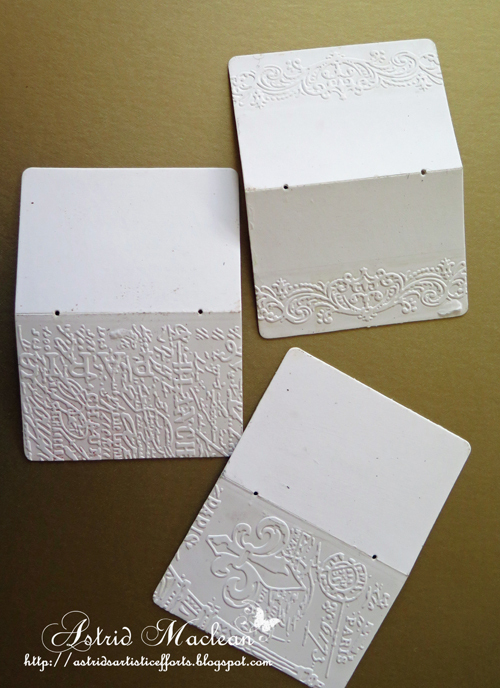 I also dry embossed the mat board inner pages, using various embossing folders. 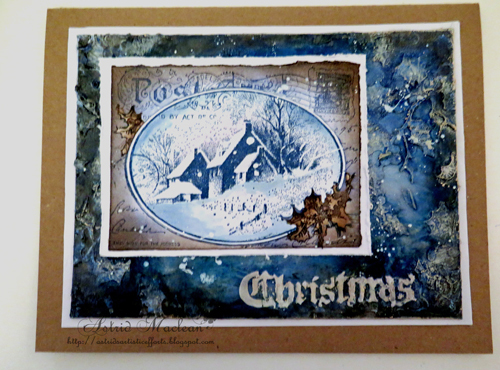 And then coloured them with the help of some acrylic paint (Paperartsy Fresco in Buff) and again the Distress Crayons. 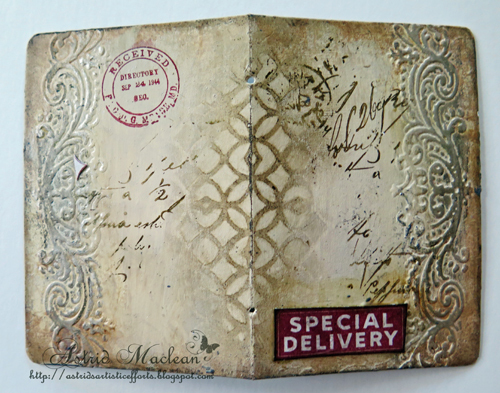 I also used stamps from the Tim Holtz Correspondence set, mostly stamped in Maroon Archival ink. 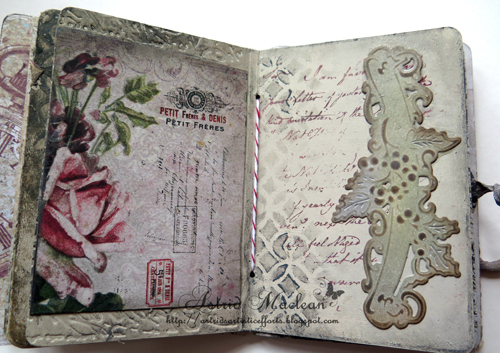 And a final example of a double page. 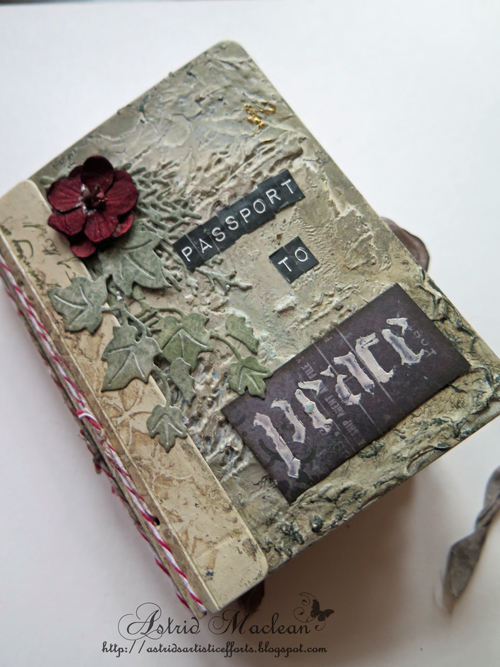 As you can see, I bound my book with twine and chose the Correspondence set because of the travel theme incorporated in that set. 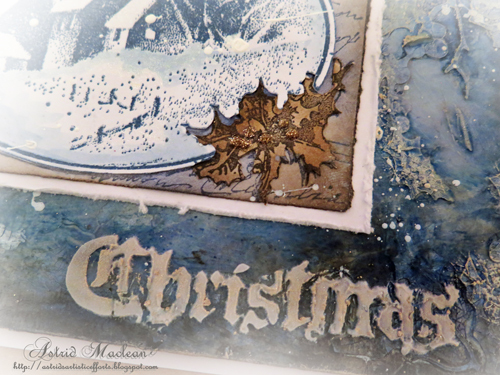 For the covers I added more textural elements by covering them with texture paste and while still wet pressing a wet text stamp into the paste. Stupidly I forgot to take a picture before finishing the cover with paint, crayon and some die cuts, but I hope you get the idea. Well, that's it, if you missed my last post about Paloma and would still like to be added to the list, please be in touch soon. I know we have hit busy times for everyone, but this is such a worthy cause in our troubled times. Fighting for what is right is worth it! Thank you for your visit like always and may Peace be with you!! Hello all, and happy Monday! 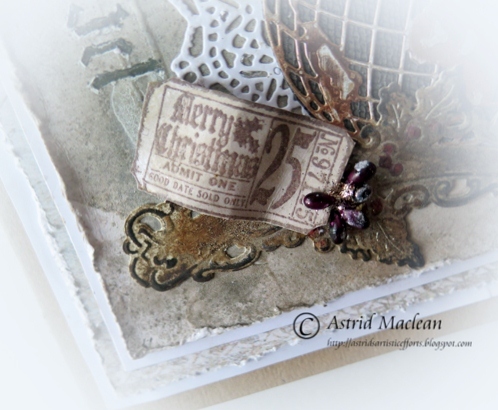 Today I am sharing a vintage holiday card over on the Shimmerz blog, so just a little preview here. Have a happy week and see you next time! Hello friends and visitors, thanks for dropping in. 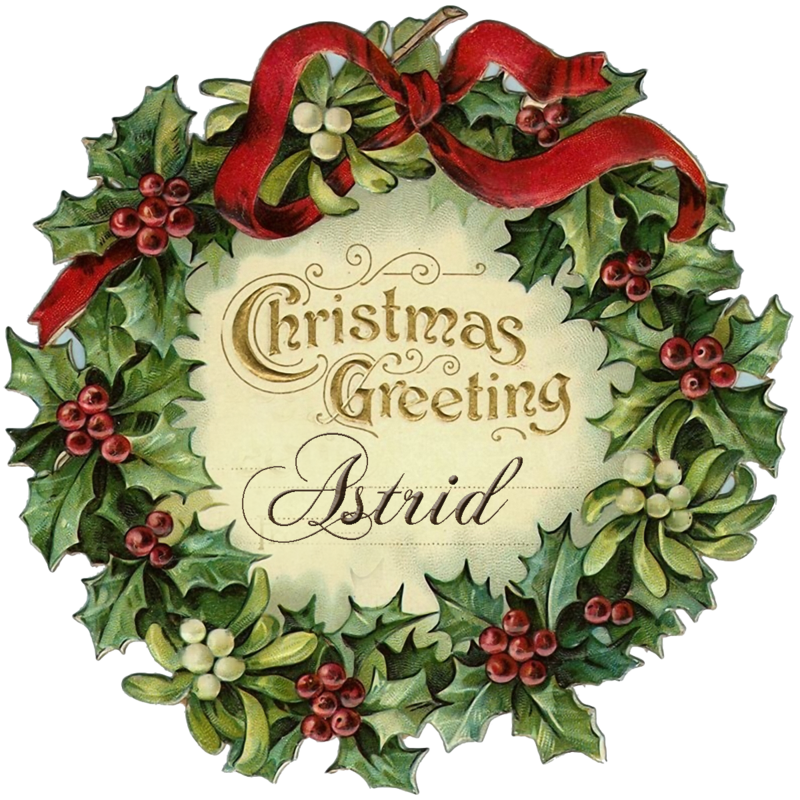 We have a new challenge starting over at A Vintage Journey, the lovely Alison from Words and Pictures is our host and she chose the theme Cracking Up. 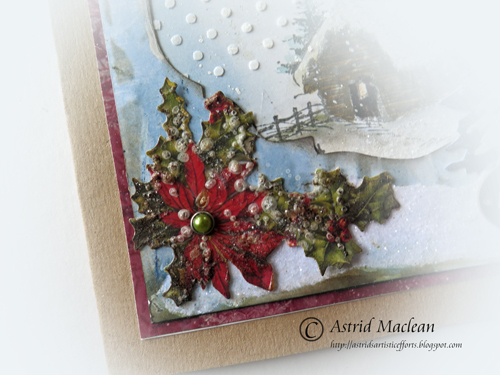 Share your crackled projects – whether your crackle is stamped, painted, texture paste or any other kind of crackle. 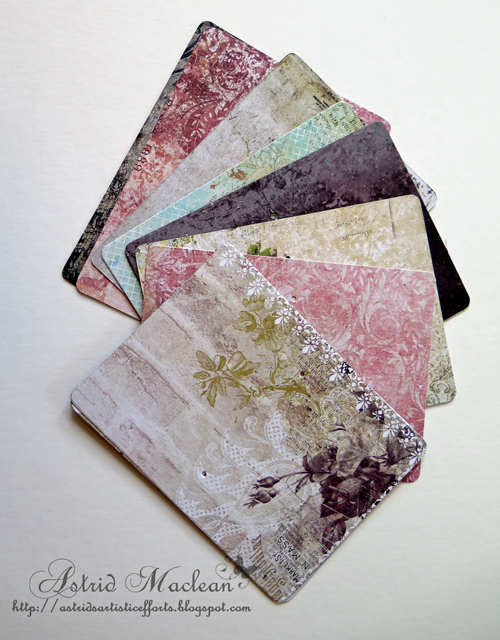 To be a winner or Pinworthy mention your project must be in a vintage; shabby; mixed-media; art journaling; industrial or steampunk style. 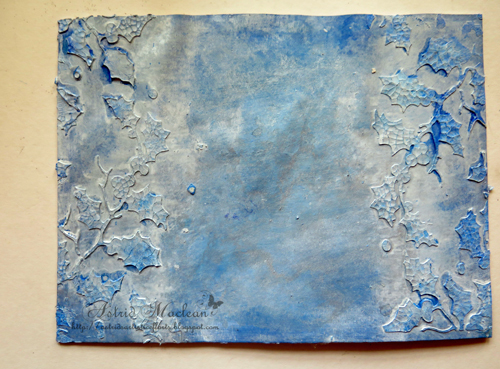 Next I started to add colour with acrylic paints, in various blue and buff tones, using both a brush and a baby wipe to blend. 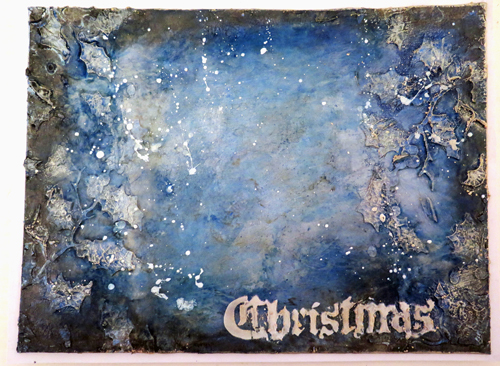 Here you can perhaps see a bit better how the paints settled into the crackle textures. Because I wanted my favourite vintage look, I added brown tones around the out side with the help of a coffee coloured gelato. 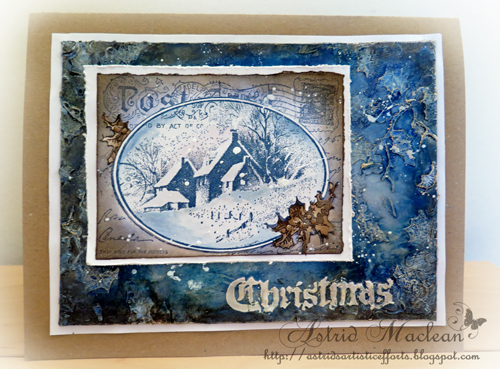 I also added some white paint splatters for a snowy effect. 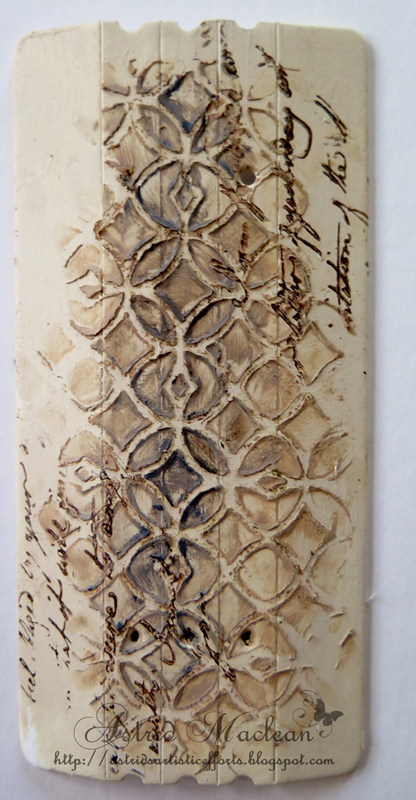 The raised bits were further highlighted with Treasure Gold gilding paste and I also stencilled a word (again from a Tim stencil), highlighting that also when the texture paste had dried. 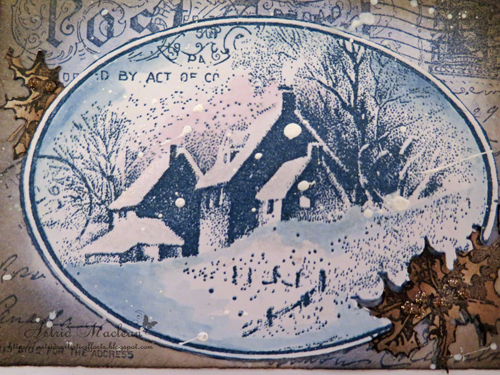 Next I stamped my focal image, a Stampendous stamp that I recently received, though it is quite an old one. 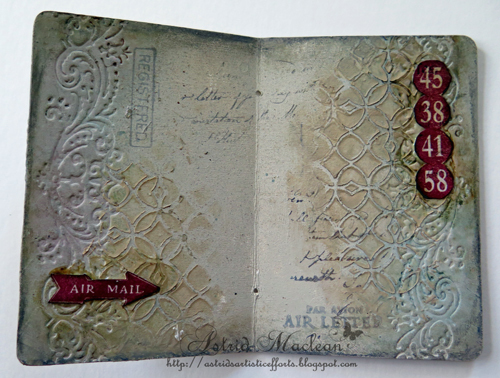 I stamped it in dark blue archival and then blended faded jeans and brushed corduroy distress inks around it. Then all that was left was to put it all together. 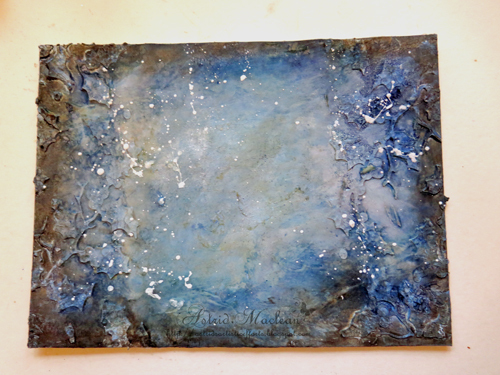 I matted and layered with white in between, so it would not get too dark. 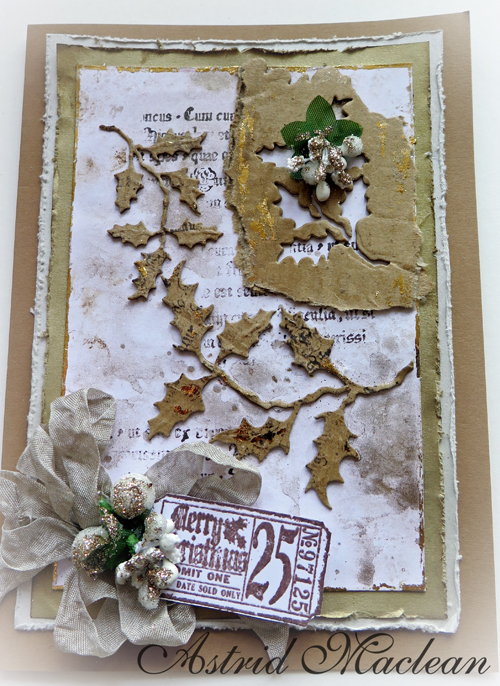 Make sure to hop over to A Vintage Journey if you have not been there yet, to see all the amazing projects my teamies have created and read all the details of the challenge. 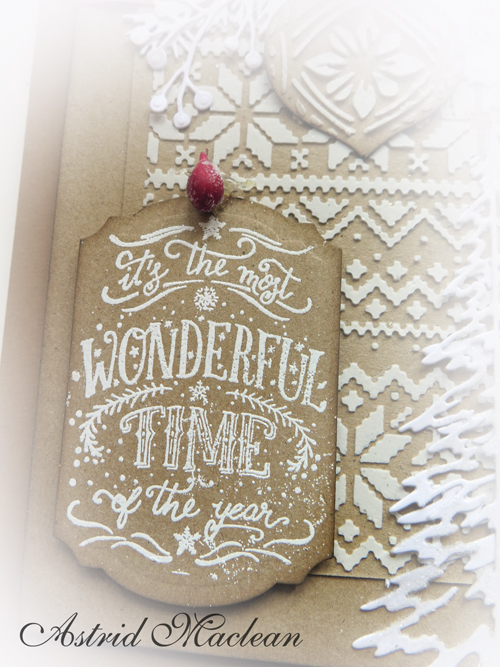 And of course we all hope you will get out your crackle and play along! 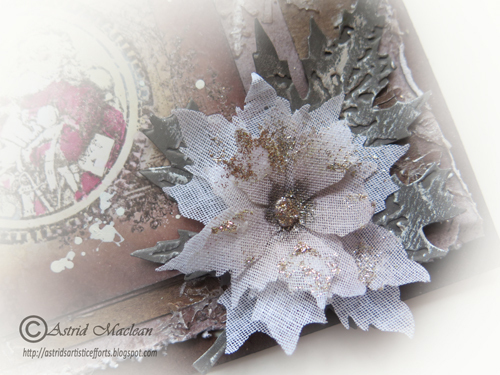 Thanks for your visit here today and happy creating! !